Greenwood Cemetery is one of the older cemeteries in Bradford Township, with burials starting in 1860. Civil War veterans made for many of the first interments. Their graves can be found in the southwest corner of the cemetery, near the Soldier's Monument. Some Civil War graves in this area remain unmarked. It is rumored that the very first burial in Greenwood Cemetery was a local gristmill operator's daughter, who died in a mill accident. The Soldier's Monument was erected in the late 1800's to honor the veterans of all wars. Every other year, Memorial Day services are held near the monument. Visitors to the cemetery may be interested to hear that we proudly fly two flags that were previously flown outside of the nation's capital building in Washington, D.C. The flags can be seen atop the flagpoles next to Greenwood's entrance gate each year during the Memorial Day weekend. Greenwood Cemetery has grown since 1860 to a size of over 20 acres. Large native trees shade much of the grounds, and gravel roads curl through sections of plots. 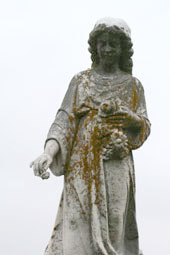 Located off of county blacktop T76 on Beaumont Avenue, the cemetery is not far from the Little Brown Church in the Vale. Many of the forefathers of this notable church are buried within Greenwood Cemetery. Our newest section of lots is located where the former Greenwood Independent School District Schoolhouse used to stand. This building was moved to the nearby Chickasaw County Historical Society's Old Bradford Pioneer Village Muesum.